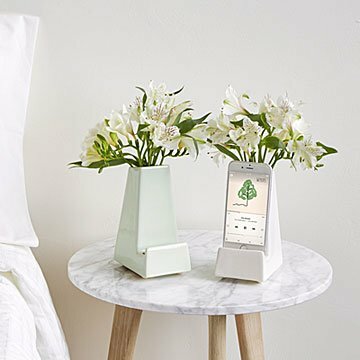 Part smartphone stand, part vase, this bloom box brightens up your bedside table. Handmade by Heather and Myles Geyman out of glazed stoneware, the stand holds a bouquet of fresh-cut flowers or ever-lovely dried blooms. Keep your existing phone cord nestled into the groove on the bottom of the stand so you can charge your device while it sits pretty among the flowers. Handmade in Pittsburgh, Pennsylvania. So cute! Makes a great gift! This looks handmade and makes a great gift. My friend read liked it! Looks lovely and is so useful. Product is attractive. Note Silk flowers not included. Again, disappointed that actual Vase depicted in photo was not what was delivered. I thought silk flowers were included. The vase is overpriced without addition of the flowers. No ability to charge either. My daughter is always borrowing my phone cord, so I thought this would stop that. I'm concerned that the vase isn't very stable and it is small. Looks great by her bed and is functional too. I used real succulents, so getting the dirt in there was a little tight, but the space saving design makes it worth it. I like that it uses your existing charger, so there's nothing built in that can fail. small but perfect for bedside table. My bestie loved it! This was a christmas gift. It is very pretty and practical.